Regular readers of this blog will know that I regularly comment on how much I enjoy – and am often inspired by – meeting disabled colleagues who are doing great things across the Civil Service. Role models are important, as they encourage others to bring their full selves to work. In this, the first of a series of three blogs, I will share some personal stories. I first joined DVLA in 1987 and, after a period of privatisation, rejoined as a temporary AA in April 2009. In January this year, I secured promotion to HEO. I was first diagnosed with clinical depression at the age of 33, following a suicide attempt in 1995. At that point I had a successful career in IT, had been branch chair of my union during the first transfer of civil servants into the private sector, and had a wonderful marriage and a beautiful baby daughter. The world saw me as happy and fulfilled. I hated myself and thought everyone else would too, once they found out who I really was. I managed the depression, more or less, with a combination of medication, hypnotherapy tapes and gathering as much information as I could. Things didn’t really make much sense until, following another depressive episode, I was diagnosed with anxiety. This is the root of my problems – I can worry about anything. Once I understood this, I was able to explore proper options for coping with the highs and lows and managing my condition better. I felt ashamed and didn’t really tell anyone outside the family. Then, in May 2013, I was appointed as mayor of my community. It wasn’t a role I would have chosen, but I really wanted to make some sort of difference while doing it. So, with my children’s permission, I published my story in the parish magazine. I had expected some negative comment, but the support I received was tremendous. What shocked me even more was the number of people who contacted me privately to say; ‘me too’. 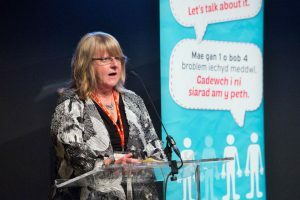 In the summer of 2014, I found Time to Change Wales (TTCW) – the first all-Wales campaign against the stigma and discrimination surrounding mental health problems. They trained me to share my story as one of their champions and since then I haven’t shut up! One of the ways I manage my anxiety is to keep busy. If my head is full of useful things and my hands are busy, then there’s very little space left for anyone else, although this doesn’t work for everybody. I volunteer alot. I’m a town councillor, help to run a food bank, sing in a choir and, after completing an ILM level 4 apprenticeship and a CMI level 5 diploma in Management and Leadership, I’m studying theology in the hope of entering the priesthood when I retire. Underpinning these activities is a passion for campaigning on mental health issues. I share my story in person for TTCW and for the Civil Service at events such as Civil Service Live and a recent joint Civil Service/KPMG Mental Health event. I also blog for a site for christians with mental health problems and work with the DVLA’s Ability group, the HR Wellbeing and Attendance Team, and in the wider community, to try and create a society where people feel safe to talk about their mental health. We have come a long way, but there is still a prevalent attitude that implies that many mental health problems aren’t real. I have heard it described as the ‘new back trouble’, or that we can just ‘pull ourselves together’. Let me tell you, if it was that easy, no one would choose to go through the pain that mental illness causes. I’m really heartened by the amount of positive action being taken around mental health at the moment, and look forward to a time when we all feel safe to say how we really feel and to ask for the support we need when we are in trouble. My name is Imran Khan. When I joined the Civil Service in July 1999 most people who met me for the first time made a reference to the Pakistani cricketer-turned-politician of the same name. Someone once told me that he remembered me breaking the college clock with one of my sixes – apparently he was at Oxford at the same time as my cricketer namesake. The cricketing banter, and the fact that I am visually impaired, meant that people, especially senior leaders remembered who I was. This helped me to establish a network of useful connections from very early on in my career. 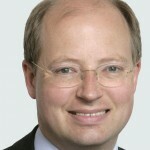 My first Civil Service post was on a three-month temporary contract in the Lord Chancellor’s Department, supporting a High Court Judge on an internal inquiry. I was excited but anxious, because I needed a screen reader on the computer to do my job. I had heard horror stories that reasonable adjustments of this sort could sometimes take months, and wondered what I would do without the screen reader. As it happened, arriving at my desk on my first day, I was met by a specialist who loaded the screen reader, contributing to a really positive start. This role gave me great experience, which proved useful when an opportunity arose to apply for a permanent position. I have since been promoted three times and worked on a range of interesting and high-profile policies, encompassing Immigration and asylum, legal aid, setting up a fund for voluntary sector advice agencies and Civil Service reforms. I am now the policy lead on work to increase social mobility in the Civil Service. So what has benefited me most along the way? Networks - My first Civil Service post was in a department with a strong disability network – including members who were blind or partially sighted. I discovered that my line manager had tapped into their insights to inform my induction. They invited me into the network. My specialist interest was access technology, and one of my early contributions was to develop proposals for screen-reader and Braille users to have quarterly conversations with screen-reader specialists to provide continuous training and resolve issues. Occasionally, especially when I’ve moved from one post to another, specialist adjustments have taken time to obtain. However, I have been able to draw on contacts in disability networks who have dealt with similar issues and helped me to find solutions quickly. Adjustments - I have highlighted adjustments because small adaptations can make a huge difference. I recall that my first post involved considerable admin work, predominantly paper-based. Acknowledging that current working practices would not be inclusive, my team decided to set a trend in communicating more electronically than was the norm at the time. My ambition is to continue to work on interesting policies, reach my full potential and be the best I can. I also want to inspire and help other talented disabled people to join and progress in the Civil Service. My advice is to go with your ambitions and not let obstacles such as delays in receiving adjustments limit your self-belief. Also, use the staff networks, as very often there will be someone who has overcome similar challenges and can offer suggestions that may make all the difference. The life stories shared by Sue and Imran are inspiring and offer unique insights that we can all learn from. What our people say about their experiences within our organisations tells us a great deal about how inclusive our culture really is. Colleagues take cues from how we all behave. So, whether you’re a manager, leader, champion or ally, please reflect upon these personal journeys. Use them to start more conversations and to think about how you can create environments where talented people with a disability across the Civil Service can thrive and be the best they can be. Thank you Phillip for another thought provoking blog which encourages action not platitudes from us as leaders. 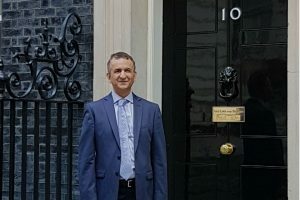 My own Disability Services & Dispute Resolution Directorate within DWP is drawing very much from similar humbling stories to those of the inspiring Sue and Imran. By personalising the impact and experience of colleagues and sharing our own stories, it really does mobilise leaders to promote and up skill to break down barriers enabling fairness and accessibility for everyone at work. Our Mental Health first aiders and attendance management master classes are 2 of many examples in DSDRD but equally our customer InSite sessions where colleagues hear directly from customers who come into our backroom service centres and share their experiences of our service, help humanise potential improvements we can make and encourages more inclusivity.